Annan boss Peter Murphy made 5 changes from the team which defeated Cowdenbeath on Saturday with Brannan, Moxon, Wright, Ferguson and Wallace all being introduced to the starting eleven. Annan went ahead in the 9th minute after Tony Wallace picked up a loose ball and finished with a stunning shot from 20 yards which beat Ryan Mullen. It signalled the start of a good period from Annan and shots from Sinnamon and Ferguson went close. The Celtic youngsters prodded for an opening but they found the Annan defence a hard unit to penetrate and they rarely troubled keeper Alex Mitchell. Lewis Ball tried his luck with a snap shot from the edge of the box as the match progressed towards half time but the effort sailed over the bar. Annan increased their lead in the 56th minute when a through ball unlocked the Celtic defence and Tony Wallace finished with another stunning shot from the edge of the box. Celtic were then dealt another blow in the 67th minute after a Ryan Sinnamon corner kick was headed on to the cross bar and following the melee Ross Fergusson headed the ball into the net. The scoring was completed in the 80th minute when Ross Fergusson was at hand to slot the ball into the corner of the net with a low shot after another corner kick caused all sorts of problems at the heart of the Celtic defence. 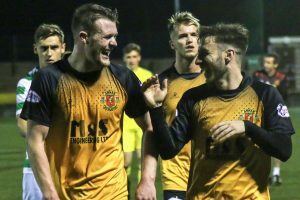 Annan Athletic – Alex Mitchell, Scott Hooper, Jack Brannan, Owen Moxon, Ayrton Sonkur, Steven Swinglehurst, Christopher Johnston (Aidan Smith 62 min), Ryan Sinnamon (Scott Roberts 70 min), Maxwell Wright, Ross Ferguson, Tony Wallace. Subs not used Robbie Minto GK, David Wilson, Peter Watson, James Creaney, Tommy Muir. Celtic – Ryan Mullen, Lewis Bell, Daniel Church, Robbie Deas, Stephen Welsh, Kerr McInroy, Paul Joseph Crossan, Mark Hill (Barry Coffey 70 min), Jack Aitchison, Ewan Henderson (Scott Robertson 80 min), Regan Henry (Scott Robertson 70 min), . Subs not used – Reece Wilson, Paul Kennedy, ThomasCaffrey. Referee – Lloyd Wilson​​Assistants – Daniel MacFarlane and Ryan Kennedy.